The Mormon Tabernacle Choir is celebrating their 80th year of the popular “Music and the Spoken Word” broadcast. Richard L. Evans (pictured) was the beloved announcer for Music and the Spoken Word from 1930 to 1971. 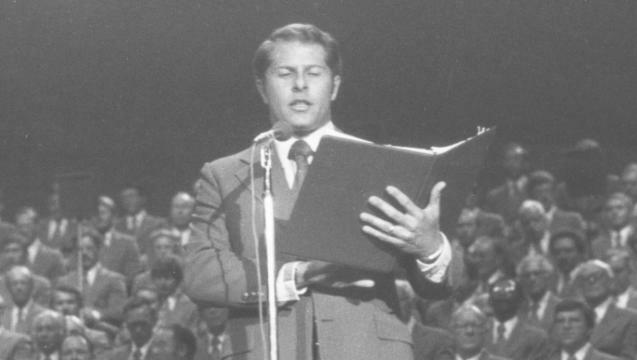 Following Brother Evans, two men have carried the role as announcer for the program: Spencer Kinard (1971 to 1990) and Lloyd D. Newell (1990 to present). When the broadcast first began, on July 15, 1929, a local radio crew had their control room connected to an amplifier near the choir, a block away. One microphone picked up the sound of the choir and the voice of their 19-year-old announcer, Ted Kimball. Several months later, Richard L. Evans became the announcer as the program gained in popularity.